The water conditioner works immediately, turning the tap water into water suitable for the life of fish. • adds iodine, magnesium and all the vitamins of the B group. 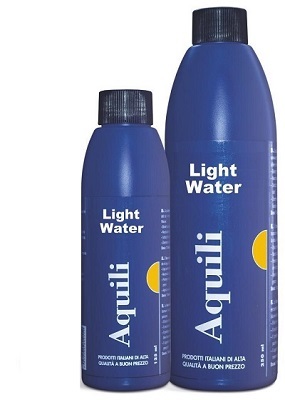 Also available in the special 2000 ml package suitable for owners of large aquariums. The product is supplied with a dispenser and each dose is sufficient for 20 liters of water. The water conditioner Red designed specifically for low temperatures works immediately, turning the tap water into water suitable for the life of fish. that works effectively on Phosphates, both in fresh and salt water aquariums. 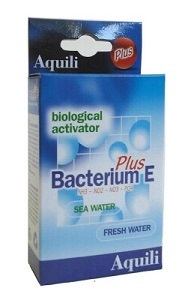 Bacterium E Plus into your aquarium. • Is effective even in fresh and salt water aquariums. of overdose). In case of low pollution, for a milder action use 1 capsule but every 400 liters. • It ensures a quick biological activation of the filter, allowing faster introduction of fishes. Some of them can be introduced as early as 24 hours after set-up. • It activates and speeds up the decomposition of azotic compounds – ammonia, nitrites and Nitrates, creating an optimal environment for fishes and allowing fewer water changes. Under ideal conditions the nitrogen cycle is completed and total reuse of the waste material is obtained. 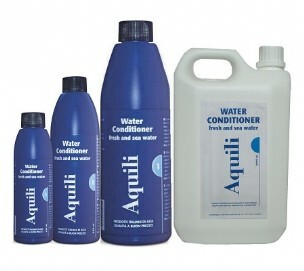 • if used regularly it allows to keep under control the critical values (NO2 / NO3) of the aquarium. • It restores and strengthens weakened bacterial flora during partial changes of water, cleaning or replacement of the filter material or after treatment with medicines. In case of low pollution, for a milder action use 1 capsule but every 200 liters. Enzymes are biological catalysts which speed up chemical reactions among molecules and reduce the activation energy. 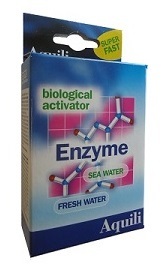 Enzyme, a concentrated and selected blend of enzymes, increases the rate of biological reactions and in particular it assists and accelerates bacteria reactions. Combined with Bacterium E biological activator, which is also a blend of bacteria and enzymes, Enzyme enhances its performance. • Aquariums and new systems – it helps attaining the optimal conditions for the filtering system. • Aquariums with high pollution levels caused by biological overload – it quickly reduces pollution levels by helping the bacterial action. • Skimmers – it quickly and visibly increases their effectiveness. Vitamins and amino acids are essential to the life of fish, plants and sea invertebrates. Vitamins contained in water and food are often insufficient and the living organisms in the aquarium are not able to produce the amino acids. Therefore, Vitamins and amino acids must be given periodically from the outside. MultiVitaminic & AmminoAcids brings a balanced and correct quantity of these substances, which are essential for a beautiful and healthy aquarium. The product is enriched with IODIUM, whose lack causes serious problems to living beings. Vitamins and amino acids are essential to the life of fish and plants. Vitamins contained in water and food are often insufficient and the living organisms in the aquarium are not able to produce the amino acids. Discus Vitamin - designed specifically for the Discus - brings a balanced and correct quantity of these substances, which are essential for a beautiful and healthy aquarium. Particularly indicated during the reproductive phase, during this period it is recommended daily use. Vitamins and amino acids are essential to the life of fish, plants and sea invertebrates. Vitamins contained in water and food are often insufficient and the living organisms in the aquarium are not able to produce the amino acids. Therefore, vitamins and amino acids must be given periodically from the outside. Coral Vitaminic & AmminoAcids - designed specifically for the sea water - brings a balanced and correct quantity of these substances, which are essential for a beautiful and healthy aquarium. Natural extract of Aloe Vera (Aloe Barbadensis Miller). Healthy mucous and fish skin, plus natural healing of small injuries or inflammation is important for fish health. Aloe Vera has a wide spectrum of use with important effects amply demonstrated by modern scientific research. Use 1 or 2 times a day after stressful situations (transport, manipulations ...) or in case of infections. You can use it in the aquarium or for medicinal baths in special tanks. Makes aquarium water clear and bright as it binds the particles in suspension. Combining them and making them fall allow to the filter to remove them. It is immediately effective. First results can already be seen after 2-3 hours. Water will be completely cleared within 6-12 hours. Light Water can be used with all KH-levels. Light Water can be used with all values of KH. DOSAGE: 5 ml for 10 litres of water; for very soft water and for water poor of limestone (<1°dKH) only use half dose. USE: to be used when the tank is devoid of transparency and after each water change and/or siphoning of the fund. Let at least 48 hours pass between one another usage. The cloud that appears is not harmful to fish and demonstrates the effectiveness of the products. • It reduces the carbonate hardness (KH) bringing it to optimal levels, decreasing also the pH value, determined by KH and CO2. • The pH and KH values are progressively modified, so as not to harm the life of fish and plants. New aquarium: for a perfect tropical water, add 5ml (1 cap) of pH/KH every 20 l directly into the aquarium where there are no fish. The pH value will be reduced of 2° dKH. Repeat the operation every 2-3 days until the pH and KH value are at ideal levels. Aquarium already in use: to improve the characteristics of the aquarium, add 1- 2 ml of pH/KH every 100 l; The pH value will be reduced of 0.4° dKH. Repeat the operation every 2-3 days until the pH and KH value are at ideal levels. Ammonia poisoning: (from 1.5 mg of NH3). Add 5 ml (1 cap) of pH/KH every 20 lt of water to neutralise the ammonia in seconds. Note: Use the pH/KH test to make sure that the KH level is never below 2° - 4° dKH as there could be pH oscillations. If this happens, add pH/KH +. During the treatment ventilate the water and do not add CO2. Suitable for all aquariums that require hard and alkaline water such as for African cichlids or viviparous fish. For best results we suggest using in combination with our KH+ which increases the hardness of water in a selective way. Doses: 5 ml (1 cap) in 25 liters of water. Add the product in the aquarium at the recommended dose. Measure the pH after two hours; if necessary, if necessary, repeat the process until the desired value of pH is reached. Suitable for all aquariums that require hard and alkaline water like such as for African cichlids or viviparous fish. For best results we suggest using in combination our pH+ which increases the acidity of water in a selective way. Doses: 5 ml (1 cap) in 50 liters of water increases the hardness of about 1°. Pour the product in the aquarium in the recommended dose. It is recommended not to increase the total hardness more than 2° per day. It is especially recommended for aquarium without live plants (only artificial plants); in critical situations with a sudden drop in oxygen levels due to overfeeding or increase of watertemperature; also in case of improper and over dosage of disinfecting agents. Dose: 10 ml for 40 liters of water.